Seriously. These scones are the BEST you’ll ever make. Did you know that making scones can be SUPER easy too? I had a friend ask me on the MOMables Facebook page what she could do with a huge batch of cherries she has in her freezer. 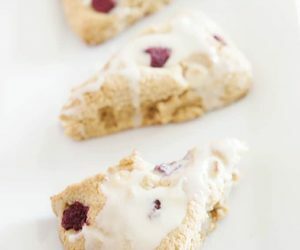 While I could name her about ten things she could make off the top of my head, I told her that these scones will rock her world – and yours too if you take the 20minutes to make them! My mother-in-law shared this recipe with me about eight years ago from her trip to the Culinary Institute of America in Napa, CA. What I love about this recipe is that you can make a huge batch of scone dough, freeze it and pop them in the oven as you need them. If you need to make these dairy free, the revised recipe is at the end. Enjoy! This basic recipe can be transformed into your favorite scone! Cut two 10-inch circles of parchment or waxed paper. Use one to line a 10-inch round cake pan; Reserve the second piece. In a large bowl, sift the flour, sugar, baking powder, and salt together. Make a well in the center of the flour mixture. Add the cream or half and half to the flour and stir, until a batter is formed. Fold in fruit or add-ins. Transfer the thick batter into the lined cake pan and press into an even layer. Cover pan with the second parchment paper circle and freeze, until the dough is very firm, about 6 hours or overnight. To bake, preheat the oven to 350F. Line a baking sheet with parchment paper. Remove the dough from the freezer while the oven preheats and turn the cake pan upside down onto a cutting board. With a large knife, cut the dough into 10 equal wedges and place them on a baking sheet, 2 inches apart. Brush scones with milk and sprinkle with coarse sugar (optional). Thaw the dough for 5 minutes at room temperature; turn it out of the cake pan onto a cutting board; Cut the dough into 10 equal wedges and place them on the baking sheet about 2-inches apart; Brush the scones with milk and sprinkle with the sugar. Bake the scones until golden brown, 30-35 minutes and remove from the oven to cool down to room temperature. Want to make this recipe whole wheat? Use 2 cups whole wheat white flour (pastry flour) and 1 cup white flour or if using regular whole wheat flour, use 1 cup whole wheat and 2 cups white flour. To make these scones dairy free, substitute canned coconut milk for the heavy cream of half and half. glad you liked these! I am not kidding when I tell you that these scones are super EASY and delicious! I’ve never made these gluten free and I’m not familiar with every gluten free mix. you could try swapping it out… but i can’t guarantee that they will be the same.